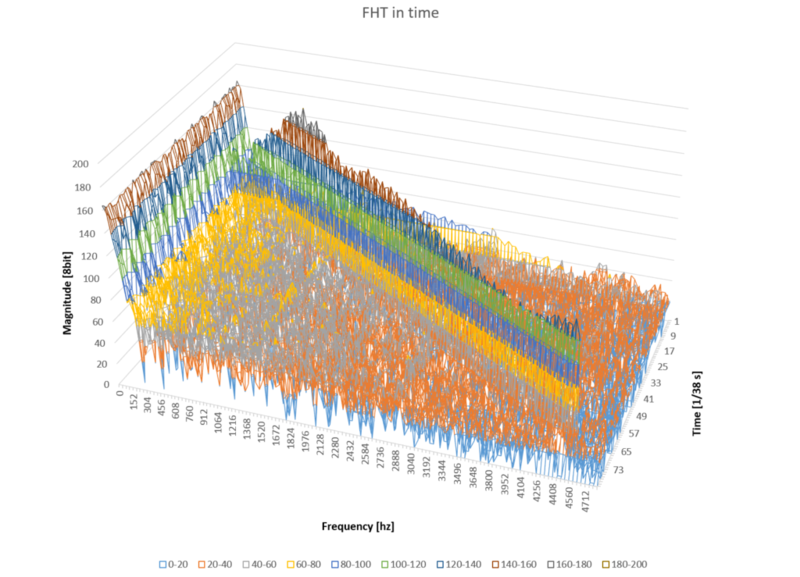 « Why use – Fosphor, a GNU Radio real-time spectrum analyzer? Recently I have been doing some projects with the Arduino electronics platform. One of the projects involved benchmarking certain motors and required me to measure noise levels. I will cover that project in more detail in one of the future articles, but now I would like to write about the process and best practices of measuring sound levels and analyzing frequencies with an Arduino. I will talk about sound, microphones, sampling, FFT and more. This article is going to be targeted towards beginners, who are neither signal processing experts not electronics experts and it will be fairly high-level with links for more thorough reading. Sound is a wave that moves in space and when it is stored (in digital or analog form) it is represented by a Waveform, which is the amplitude of the wave measured at each point in time at a certain point in space. You can think of this as sound passing through a microphone where it is being measured constantly and the measurements form the waveform. Because we can only measure a finite number of times per time unit, this process of measuring is called sampling and it generates a discrete signal. Furthermore, each sample in time is also made discrete during this process as computers and integrated circuits have finite accuracy and storage. Arduino capability for measuring signals and converting them to logic that the micro-controller (MCU) can process is provided by the Analog-to-Digital-Converter (ADC) that is pat of the MCU. Therefore, for an Arduino implementation, this process translates to connecting a measuring device (microphone for sound) to the MCU and sampling the value at the device by the ADC at a constant rate. The Arduino ADC senses voltage levels (typically in the range of 0-5V) and converts them to values in the range of 0 to 1024 (10 bit). Depending on what we are measuring, sound levels may be very quiet or very loud. On one hand, a microphone on its own is usually not able to provide enough voltage for the Arduino to sense a change. The ADC needs a 5V/1024=4.8mV change to increase the digital value by 1, but a typical “electret microphone” might not provide this amount of voltage change for quiet sounds. For this reason a microphone is often used with an amplifier. On the other hand, a very loud noise and a high-gain amplifier can bring a signal to the max 5V, “over-exposing” or “clipping” it and again bringing us to a situation where the sampling is useless. Therefore it is important to match the device and the amplification level (gain) to each use-case scenario. When choosing a microphone for your Arduino you can get one of the available “microphone modules” that combine a microphone with an amplifier or some other logic on a tiny PCB. You can also make your own module, which has the added advantages of being able to control all the different aspects of the mic and amplification. I chose to get a module that is available of-the-shelf because it is easier and faster than making your own. If your goal is to record sound and get a fixed sound level even in unpredictable situations you will want to get a module with automatic gain like this one based on MAX9814 from Adafruit. Such a module will “normalize” the sound to a set level. This will be the right solution for a scenario where you want to record voice for playback or to run a frequency analysis. Naturally, this isn’t the right choice for measuring sound volume. To measure sound volume and to be able to compare different measurements one to another you need to use a module where the gain is predictable. It doesn’t mean that the gain is fixed, it just means that the gain is configurable by you and does not change automatically. I have evaluated 3 such modules. It is worth noting that a specific design might be on the market under different names as different manufactures make their own versions of the design with their own model numbers. Look at the board layout and note the main chip so you can identify the device. I got mine from the Far East but it looks like it is based on an Adafuit design. This module has an adjustable gain that you control with a tiny 1-turn potentiometer. There is a Vcc pin, a ground pin and an analog out pin. The analog pin emits a waveform where “0” is Vcc/2 and the amplitude depends on the gain and the volume of the sound. 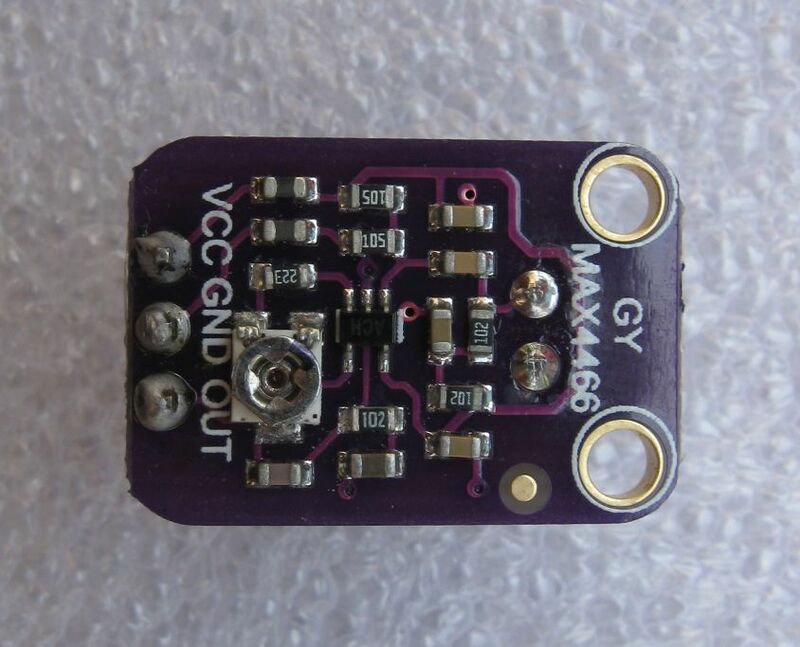 The MAX4466 chip is an op amp that is specifically optimized for use as a microphone amplifier, which makes this module a great performer and my eventual choice for the project. I got this module from a local electronics store. Not sure who designed it, but it has a multi-turn potentiometer, no amplifier and a LM393 comparator chip. There is a Vcc pin, a ground pin, an analog out pin and a digital out pin. Since this module lacks an amplifier, it is only good for sensing loud sounds, such as claps and knocks. The presence of the LM393 allows you to configure a threshold so the board can generate a digital output when the sound level is above the threshold. The only advantage that I can think of that this would have over implementing a threshold in code is that either 1) the comparator is more sensitive that the ADC of the MCU or 2) you don’t have an MCU in the first place and are wiring this board directly to a relay or a similar IC. Some sellers advertise this module as having an LM393 amplifier, but detailed analysis shows that it is not the case and that the analog out pin is not amplified. I got this one from the same local shop. This one is similar to the HXJ-17, but it is even simpler. It has a one turn potentiometer and no analog output. Leaving this useful for knowing if there is or isn’t a loud sound. // determine if analog or digital, determine range and average. You can then make some sounds at different volume levels and see how your average, min, max and span values respond. Looking at the result you might see that you need to adjust the gain potentiometer such that you utilize the max span for your sound levels while not overdoing it so not to clip your signal. The analogRead function of Arduino makes it simple to get a digital value of an analog pin. It was implemented with single sample collection in mind. When sampling sound it is important to take our samples at a constant rate and to take each sample accurately. To achieve these two properties we will change a couple of things. First, we will configure the ADC to use 3.3V as the analog reference voltage. The reason for this is that the 3.3V is usually more stable than the 5V. The 5V can fluctuate up and down especially when the Arduino is getting its power from the USB connection. The 3.3V is coming from a linear regulator on the Arduino board and can be connected to the ARef pin of the Arduino. This calibrates our ADC to map the 0 to 3.3V range of the analog input to the 0 to 1024 range of the digital values. For this to happen on the electronics level you need to feed your module with 3.3V and to connect the Arduino ARef pin to 3.3V. Make sure that your module is capable of operating at this voltage. Second, we will configure the ADC to work in “free-running” mode and read the sample values directly from internal registers, bypassing analogRead. As mentioned, analogRead is designed to read one value at a time and will perform initialization of the ADC for each read, something that we better eliminate. This will allow us to get a sampling rate that is more predictable. Third, you can also adjust the speed of the ADC. By default the ADC is running at 1:128 of the MCU speed (mode #7). Each sample takes the ADC about 13 clock cycles to get processed. So by default we get 16Mhz/128/13=9846Hz sampling. If we want to sample at double the rate we can change the divider to be 64 instead. You can see all three of these code snippets implemented together in the source code of the project at github. With this logic in place we can get decent waveform data for the Arduino to process. The sound level is defined as the amplitude of the waveform and can be measured per set of samples which represent a part of a signal. 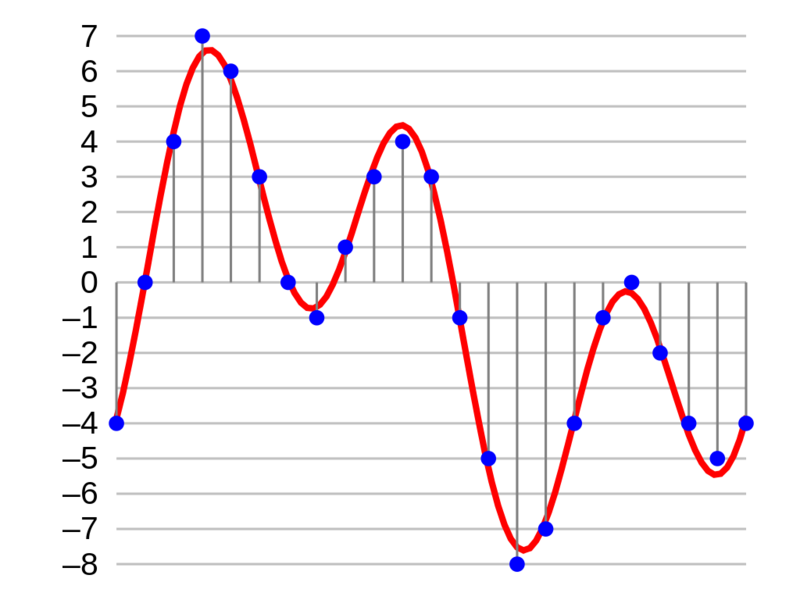 For an ideal sine signal, the amplitude would be the max sample, but in practice it is easy for some samples to be outliers and to affect the max value significantly. For this reason it is more practical to use a metric that takes all the sample values into account. You can use an average, but it is more common to use Root Mean Square (RMS) which will give more “weight” to higher values. The relationship between amplitude and RMS for sine waves is known and is amplitude= sqrt(2)*RMS. If we assume that a sound waveform is similar to a sine waveform we can use this relationship to estimate a stable amplitude based on an RMS value that we calculate. Where dB is the level is dB units, v is the sample value and v0 is the reference value. I was trying to achieve relative measurements, I chose v0 as the max possible amplitude (1024/2 for a 10bit ADC). This yields dB measurements which are specific to a certain gain and my device, but as long as the gain remains fixed, I can take several measurements and make valid comparisons between them. If you are looking to measure absolute sound levels you would need to calculate your level relative to a standard agreed sound pressure baseline value of 20 micropascals, which is the typical threshold of perception of an average human. Practically, this is typically done by attaching a special calibration device to the microphone. The device generates sound at a fixed dB level and you can adjust your calculations such that your dB measurement matches the dB value of the calibration device. When using a reference value that is higher than your samples (max amplitude), your dB values would be negative and smaller as you approach the max. When using a reference value that is lower than your samples (threshold of perception), your dB values would be positive and larger as you approach the max. To make this even more complex, several factors affect measurement in practice. First, the human ear is not equally sensitive to all frequencies. It is typical to apply different weights to different frequency ranges. One such a unit of measurement is called dBA, but there are others with slightly different weights. Second, your microphone might not have equal sensitivity to all frequencies. Third, your speakers might not have equal ability to reproduce all frequencies at the same exact level. These complexities require very accurate and expensive equipment together with special calibration procedures to be able to measure sound levels correctly per standards. You need to understand that your ability to measure sound level with the setup described here is pretty rudimentary and suitable for rough relative measurements only. So now with proper module and calibration you can measure sound level of different events or devices and compare them one to the other. What if you want to “break” the sound into individual frequencies and measure or visualize each individual frequency? Can this be done with Arduino? The answer is that it can be done relatively easily thanks to some existing libraries. To turn signals from a time domain to a frequency domain you would generally use a Fourier transform. Such transforms are used for signals of different types, sound, images, radio transmissions, etc. Each signal type has its own properties and the transform that best suits a sound signal is the Discrete Hartley Transform (DHT). DHT will work with discrete, real values which form our waveform. To implement DHT we will use Fast Hartley Transform (FHT) and specifically the ArduinoFHT library. The Arduino FHT library works with vectors of 16 to 256 samples. This size is denoted as N. In this project I will be using N=256 to achieve maximum resolution, but you may use smaller values if you are short on memory or processing power. First, the algorithm takes N real numbers and results in N/2 complex numbers. Then we can pass the data to another function to calculate the magnitude of the complex numbers to get N/2 bins. In the end we get N/2 bins, each covering a frequency range of sampling_rate/N Hz. The highest value of the last bin will be sampling_rate/2 . The reasons for this relate to signal processing theory, specifically aliasing and Nyquist law. In practice, if you want to avoid any strange effects, such as higher frequencies “folding” over lower frequencies, you will need to make sure to use a sampling rate that is twice the highest frequency you expect to have in the sound signal. Otherwise you are not sampling fast enough. You should also not over sample, as it will result in low ADC accuracy and wasting of FHT bins on ranges that don’t appear in the signal. I found the value of 20Khz to be a good upper frequency based on the range of my microphone and on the range of typical human hearing. As a result the, sampling at 38.4Khz (divider=32) seemed optimal. So for N=256 and sampling_rate=38.4Khz we get 128 150hz bins with the first been holding the magnitude value of 0-150hz and the last bin holding the magnitude value of 19050-19200hz. We can now focus on specific bins that interest us, send the values of all the bins over serial connection, store the values, display them in some way, etc. One of the fun ways to use the data, especially when troubleshooting and developing is to visualize with an analyser. Load the following FHT example code to the Arduino or adapt it to your needs. It gets the samples, runs FHT on the data and sends it in binary form over serial. Your Arduino should be connected to a computer running Processing development environment. 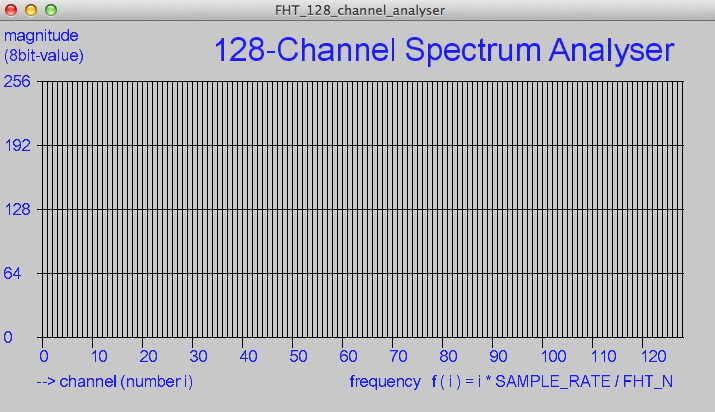 In Processing, load the “FHT 128 channel analyser” project. I had to make a change to the project to make it compatible with Processing 3.0 . To do so, move the call to “size” function from within the “setup” function to a new function called “settings”. My code for this project can be found at github for you to experiment with. The Arduino can be used for relative sound level measurement and for frequency analysis/visualization. One just needs a microphone to match the use case, an Arduino, some coding and optionally the FHT library. Have fun and let me know in the comments if you make something nice using such a setup. Did I need the FHT library for the MeasureVolume? You don’t need FHT for the MeasureVolume part. What didn’t run? Do note that the code snippet in the article is just a snippet, and not a full Arduino program. See https://github.com/ayavilevich/ArduinoSoundLevelMeter for the full code. Hi Arik! What a piece of nice project you had done. Yea I m really impressed because I love all code for sound processing. I really want reproduce it on my workbench and put some neopixel and oled screen to work together. But first of all I’m Teensy3 user go away from Arduino centuries ago. FHTnot really is compatible with Teensy and ARM. I tried finding FHT adaptation for Teensy but without success and I found that sound processing with Teensy Audio library is much better easier and efficient than any other stuff like that. But in my mind still blinking think about adaptation FHT to Teensy. Maybe you know where I can start digging for that? By the way I will try putting pieces of your functions to teensy FFT. At first glance looking pretty easy to do. I let you know if I get results. Cheers!! See comments by Ricardo below. He worked on doing something similar with ARM and posted his results. Maybe I missed something in my first read of this lovely blog post, or else it’s a little cryptic. But I’m wondering what would make the best module for measuring sound pressure levels (between some 50-60 dB to +100 dB) for music played (at I believe 432Hz) through a speaker? Also, if it’s possible I would like to be able to make the PBC and solder it myself, even if it has to be a much larger scale. Actually nevermind the 432Hz frequency, I seem to have confused it with something else. I mean the range between 20Hz to 16K Hz which covers every instrument and vocal. Hi Max, signal processing is a bit difficult to explain and understand. Happy to try and clarify. With regards to the dB range, dBs are relative, so you will not be able to measure proper dB values unless you can calibrate your setup with some specially designed equipment. As the system is described above, it can only compare sound levels (tell how much sound A is higher or lower than sound B). With regards to a good module to measure sound levels, you should first try a MAX 4466 based module with an adjustable gain. For your purpose avoid modules with no gain or modules with auto-gain. With regards to the frequency range, to process signals up to 16Khz you will need to sample at least double than that, at 32Khz. See above on how to set your ADC divider to 32 (mode #5) and achieve sampling of about 38Khz. In the end, if you are interested in frequency analysis, you could pass the sampled data to FHT and get 128 bins back. Each bin will be 148hz wide. Just replying to thank you for your brief and yet very useful guide. Nice to hear, you are welcome. do abs(k-AmpMax) and you say, that you get the amplitude by this. But wouldn’t it be half the amplitude? Hi, this is probably due to confusing terms. Let me try and clarify. First, I think it depends on what kind of amplitude you are talking about. What I refer to as amplitude here is the distance referenced to zero, whose max is “Peak amplitude”. If you are thinking of the distance referenced to “Peak to peak amplitude” then it would be different. See https://en.wikipedia.org/wiki/Amplitude for more details. Other than that, analogRead values are: 0 => minAmp, 512 => “0” and 1023 => maxAmp. “Shifting down” by 512 we get: -512 => minAmp, 0 => “0” and 511 => maxAmp and make the signal correctly biased relative to its zero reference. Does it make sense now or am I missing something? This is (software) Gain and it is optional [ https://en.wikipedia.org/wiki/Gain_(electronics) ]. Used here to increase the values for signals that are too low even with “hardware” Gain at max. Applied here as a bit shift operation, so gain can be 0, 2, 4, 8 or 2^n times. Hi Matthew, glad you liked the article. The error is because the compiler can’t find a constructor variant for class String that will accept a float value. It can find a bunch of other constructor variants but not this one. I assume the issue is because your Arduino version is too old. Try version 1.5 or latest. On this documentation page you can see that String::String is supposed to have a float variant. Let us know if you manage to resolve this issue. your article is very instructive and i am eager to test this sound detection. Do you see any possibility to get it from 2 or more mics simultaneously (with only one arduino uno)? I believe you could connect several mics, one on each analog port of the arduino. However, you only have one ADC in an Arduino, so sampling N mics will reduce your individual sampling rate by N and require you to switch ports every sample (so might not be able to use free-running mode). You could work with lower sampling rate or you can increase ADC speed to compensate (loosing accuracy). I would say it depends on your requirements for sampling rate and sample resolution. Another option is to add an external ADC chip to your circuit. For example see this MCP3008 (https://www.adafruit.com/products/856). This is a bit more difficult path. thank you very much for this !! I’ll play around and see the accuracy I can acve then. Hi siva, sorry, not aware if something like that exists. I have read with interest your explanations regarding the sound level measure. First, I test with an LCD to read the values ​​in dB on the first line and a bargraph on the second one. For testing, I use a low frequency generator with a 2.5V offset and after I will do a microphone amplifier. I’m a beginner in Arduino and a programming problem : I have a maximum reading of 60 dB when I have on input a 1000 Hz sinusoidal voltage of 4.5V peak-to-peak and 0 dB when this signal is Zero (but centered on 2.5V by the offset of the generator). From 0 to 4.5V p to p, the scale in dB is respected (6 dB for a doubled voltage). I think that these 60 dB maximum correspond to the limitation of 1023 of the 10 bits analog input. But I would like to have a larger scale, eg 90 or 100 dB for a 4.5V input. Ideally, it’s be interesting to have access to a variable that would then allow entering a calibration value. Do you have an idea for this and I thank you in advance? First, please note that in this article the dB are negative with dB=0 standing for max volume and negative dB values standing for lower volumes. I guess you have made some changes to the code while experimenting so your mileage may vary depending on your reference value (v0). With regards to your question, you are right. The resolution of the reading determines the max range of the resulting dB values. Arduino ADC is 12 bit so we have 512 values of range between min and max readings. dB(range)=20*log(512)=~54 which is what you can get with the setup described above. You can add “gain” to scale the dB but your accuracy will not increase and your actual measuring range will remain the same. To add gain just scale the “amp” variable after calculating the absolute value. See “VolumeGainFactorBits” in the article for how it can be done. If you would have been processing a 16bit sound signal you would have dB(range)=20*log(2^15)=~90, which is what you might be familiar with when doing sound processing on a PC. A gain of 2^(16-12) should take you to that range. That gain is the same as shifting the value by 4 bits. Many thanks for this quick and clear reply. I will experiment with these suggestions and I will come back to you if, I have other questions. I need only to find db of detecting sound waves. Can someone please guide me on that regarding program. Which part will I have to concentrate from the above program. Arik Hello, Your project is very interesting. I’d appreciate if you could post some pictures on the circuit, perhaps with the practical scheme assembly and shield yourself used. In addition, you could add an example of the data processing carried out with excel? Hi Ciro, happy that you found the project interesting. The circuit is too simple to create a schematic for it. Gnd goes to ground, 5V/Vcc/+ to Vcc, and Out goes to A0. With regards to excel, there was no use of it for data processing, just for visualization. The serial data was pasted in excel and a “3d mesh” graph was created. LMK where you are having difficulties and I will try to provide more information. Update: the code in github is using an external analog reference. This provides more accurate sampling using a 3.3V source. 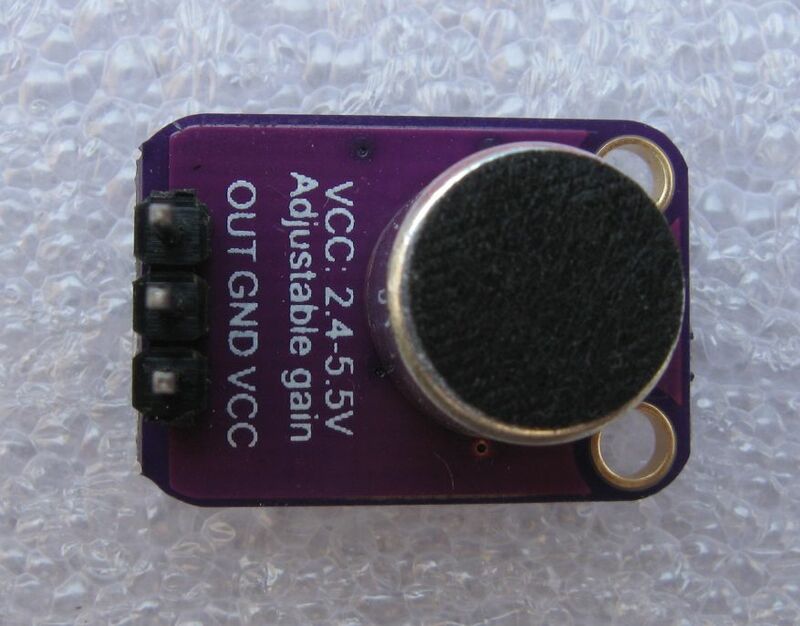 To use with the code unchanged, connect as following: Gnd goes to ground, 3.3V on Arduino to Vcc/+ on the module, Out on the module to A0 on Arduino, 3.3V on the Arduino to Aref on the Arduino. You will need to connect two points in the circuit to the 3.3V header, so use a breadboard or some connector to do that. Whatever works for you. Hi, which sensor did you end up using? I’m plannin on making a sound direction detector but I’ve read online that the KY-038/LM393 only works for loud sounds and doesn’t provide much sensitivity (low analog range). How does the MAX4466 one behave? Did you only have to conmect the mic to Analog Input or did ou use some other components aswell? Hi toki, I have used the MAX4466 based sensor for sound level measurement. It is the only one out of those I tried that is an amplifier and not a mere level detector. You can connect the OUT of the module directly to an analog input pin. I didn’t use additional components, but you can add an amplifier if you need further analog gain or just for the experiment. I have not tried using an additional amplifier. If you find a good resource on that topic, please share it here. Thanks for your interesting article. Unfortunately, I cannot read any values with the provided functions. I changed the microphone and the Arduino, but still reading zeros. Any suggestions? PS: I don’t get any uploading errors. Hi Faraz, please post your schematics and parts used. What functions did you use? Are you getting non-zero values with analogRead? Have you tried exposing the mic to loud sounds? Thank you for the reply. I have the code running now, the microphone was damaged I guess. It’s working with a new microphone now. Hi Faraz, by default the MeasureFHT() function sends binary data over serial. That binary data is meant to be consumed by the visualizing analyzer that is written in “Processing”. If you want to see textual output of the serial data, comment out this line “#define FreqSerialBinary”. I’m a newbie trying this out for myself. I have some Arduino scripting experience but have never used Processing. I am trying to use the FHT_128_channel_analyser in Processing but I am getting the error “Please fix the size() line to continue”. The fix you describe is a bit low in detail, I do not know how to “move the call to ‘size’ function from within the “setup” function to a new function called ‘settings'”. Can you advise? I have only a vague idea of how it would be done in Arduino script. If you could just post your function that should work for me. With the “size” function being called from a new function “settings” that is not there in the original example. Mind that your setup function might have other parameter values, such as serial port, etc. Ok thanks will have a go with that too! I’m working on a noise level meter and therefor I’m most interested in frequencies below 8kHz. I tried to reduce the sampling rate to get a maximum of 8kHz within 8 (or 16) channels. I tried to change ADCSRA (division factor) to 0xE6, but this doesn’t change anything. I did my tests with the example code from the FHT library. I hope you got any idea. Hi Reinhard, happy that you managed, but I am not sure I follow you. The ADCSRA is initialized in “setup” to 0xe0+7 and then the divider is further adjusted to 32 in the “ADCReClock” block. In the loop, only the ADIF bit is affected by executing “sbi(ADCSRA, ADIF); // restart adc”. The divider is not changed in the loop, instead the ADC process is restarted. Please take a look at the documentation of the ADCSRA register, it is responsible for several independent functions of the ADC. Hi Arik, you are right referencing to your code. I was using the example code from the Arduino FHTLibrary where the divider is set again in the loop. thanks for presenting your interesting work! Similar to Max W. I would like to measure dBA levels from a PA-Soundsystem between ~80 – 110dB. There is no need for an absolute accuracy of the measurement. I use the MAX 4466 based module. There is a handheld dBA-Meter, I could use to compare the readings and calibrate the circuit. Wouldn´t a slight variation of the code print out the desired dBA readings? You can use another meter to calibrate your build. Assuming you have a meter that is calibrated for a “standard agreed sound pressure baseline”, as described above, then the delta between the two measurements should be a constant value (in dB). Measure different sound levels and check the deltas. If the difference is not constant then you are probably hitting sounds that are outside of the supported range of either of the devices. The constant is a function of a ratio between the standard reference and the specific reference of your build. The ratio is in the log and becomes a constant due to log rules (http://www.rapidtables.com/math/algebra/Ln.htm#product-rule) i.e. hard math. For example, if your devices shows -10dB and the standard meter shows 30dB, then it means you can change your code to add 40dB to the value and that would calibrate your device to the standard reference. LMK how that works for you. hi! Thanks, I measured the different sound levels. Now I try to understand the math to calculate the constant value. If I do not get any further, I´ll reply. Hi Tobias, just to clarify. You measure the constant offset by making an experiment. You don’t calculate it. Once you measured the offset, you can use math to calculate how much “louder” your build’s reference point is from the “standard agreed sound pressure baseline”, but it is not required. hi! yes, I understand so far. I used a buzzer as sound source and took the readings from the meter and the arduino, for three different distances. I know, just to add the difference in dB to get the dBA, but it´s not that simple..
Hi Tobias, you are hitting the volume limit of your build. 0dB is the absolute max volume that your build can detect and you are too close to it. Move farther away, reduce gain or reduce buzzer volume. Please post data for 3 new distances such that Arduino measurement is below -5dB. Cheers. hi! The poti on the MAX 4466 Module was in middle position. Even if I turn it completely down, the reading is not below -6dB in calm environment. I didn´t change something on the gain factor bits in the original code. AFAIR, dB for quiet room should be below -20dB. By default there is no software gain, but double check that VolumeGainFactorBits is defined as 0. Try to debug the code and the circuit. Using “MeasureAnalog” is useful to see the raw readings, which should be around 512.
hi! Independently of Arduino, I viewed the output signal of the MAX 4466 Module with an oszilloscope. There is a DC offset on the output of about +2,5V. Is this the way it should be? Hi, it is normal for the DC offset to be half of Vcc. So if you are seeing 2.5V then I assume you are powering the module with 5V. Is it possible that you are powering the module with 5V but are using the “#define Use3.3” option in the code? Please check compatibility. Note that by default the code is meant to be used with 3.3V analog reference, so you would need to power the module with 3.3V. If there is a mismatch, it would look like there is “signal” even when the room is quiet, as you are experiencing. The information for 3.3V and 5V operation is described above in the article and comments. Take another look. hi! I read the article very carfully, but for some reason I´ve mistaken “module” with “arduino board”.. I wondered how to drive Arduino with 3,3V, so I powered all components with 5V, sorry 😀 Now it works fine, in quiet room 0% soundVolRMS and -54dB. It is very sensitive to the orientation of the buzzer as sound source. For reproducible results, I´ll mount the sound source, meter and module-mic on a rail. Great news! Happy to see that it works well for you now. It is interesting about the orientation of the buzzer. What about the orientation of the mic? It looks unidirectional unlike a typical sound meter. I made new measurements with a mechanically more stable construction. But I´m not satisfied with the quality of the buzzer, also the sound spread is unfavorable. I´ll mount a small speaker and the Meter or Arduino in a fixed distance together. Then I drive the speaker with a frequency generator at some defined output voltages. That will give more reproducible results. …ok, I recognize the scheme. I just have to add the difference of the arduino reading. With the wrong hardware wiring, it seemed to be more difficult to calculate, now its clear 😀 Just add around 114 – 119dB to the reading. I´ll try to make a better test setup. Mind that the delta for “silence” measurement is different. This can be for two reasons. A) noise sensitivity differences B) Weighting differences. “A” means that your Arduino module is probably more sensitive to noise than the commercial sound level meter. So it will report a higher level in a silent room. That level is due to “noise” (inaccuracy in the circuit, not real noise). “B” is due to differences in weighting the different frequencies. You wrote that your sound level meter is dBA, this means that it weights different frequencies differently (more info in the article above). The Arduino is in “simple” dB values, it is possible to implement dBA measurement in Arduino, but it won’t be trivial. If you know the frequency of your buzzer then you can look at the A-weighting function ( https://en.wikipedia.org/wiki/A-weighting#/media/File:Acoustic_weighting_curves_(1).svg ) and figure out the specific weight, maybe understand what is going on at a deeper level. I just started with Arduino, my specialty is electrical engineering, I´m into the technology of past days – such as the construction of tube amplifiers for audio playback. I find it hard with silicon-based electronics and informatics 😀 The Arduino board laid a long time unused in my workshop..
Also thanks for your good project documentation. Today, I tested it on the PA music system, which it is intended for. Basically, the dBA readings of the commercial meter and of the Arduino seem to fit together. But it also reacts quite differently with real music – instead of the buzzer as sound source. – The heights have more effect on the meter, in contrast to Arduino, which is more sensible to bass frequencies. The readings differ partially significantly. One might allow a compromise. – The reading of the commercial meter is slow, the measured / displayed values change around 0,5s. The printout of Arduino is fast, too fast for a good readoff a LCD. Is there a way to slow it down? The meter reacts smooth, bass impulses from the sound system don´t produce great magnitudes – this is what I would also wish for Arduino. It shows great jumps in the serial reading and plotter when the music plays. – Is it possible, to make an average reading over time, around 0,5s, like the commercial meter? Then the readings of meter and Arduino would be much more similar. Some pics of the test with the buzzer, mounted on a rail for several fixed distances. A nice experiment, but not comparable with real music sounds. Great to see you are enjoying your project. Thanks for posting the photos, nice build. It is probable that the mic on the module is not as accurate as the commercial sound meter. It is quite a cheap mic/module. There could be non-linearity with volume or with frequency response. Still, you can change the time-weighting for Arduino and try to make it the same as your commercial meter. Note that the sketch prints the interval time in ms on every pass. By default it is probably around 50ms. Increase the define “MicSamples” to increase the time of each interval. I recall that “Slow” is defined as 1s, so you would define MicSamples as 38000 to get to about that. Also, mind what frequency you used to calibrate. If you calibrate with basses, it might be wrong for higher frequencies. See A-weighting graph. first i would like to thank you for this detailed paper. I would refer to a question that was already asked by Ciro, the circuit. Im using arduino uno and when you say “5V/Vcc/+ to Vcc” do you mean 3.3V on the arduino by the second “Vcc”. And can you please show the part of the circuit containing ARef. Hi Davor, when I answered Ciro’s question, I described the wiring for the, trivial, 5V use of the module. If you are looking to do the more accurate 3.3V wiring then it is a bit different. I will update my answer to Ciro above. Thanks for pointing this out. I got problem, I do sampling data from 50ms and then I calculate Vrms form that data. But Vrms from sensor GYMax4466 is still higher than I expected. Can you give me advise for sampling data from arduino uno? Not sure what Prms is vs Vrms. You should provide context. What happens if you use the code in this article? the problem is dB value is still the same (measure 69-72 dB) despite I take this sensor to noisy place (it should be more than 90 dB). Can you notice what's wrong in my code? Here are some comments that I have about the code. You are making a calculation using 50 samples, not 50ms. Why is that? Seems to little IMO. What does “Time: ” print? Not sure why you are converting to volts or where the various constants in your code are coming from. How did you decide on those values (Pref, sensitivity, gain, etc)? Please link to the formula you found. Sorry to make you confuse, on first comment I tried to take samples data for 50ms, but then I changed the code to sampling 50 samples.. I print “time” to know how long it takes to get 50 samples.. I need to convert the samples in RMS to Volts, so I can get the Value of SPL using that formula..
With the additional information it starts to make sense. I understand that: 0.0063 is the mic sensitivity [V/Pa], 0.00002 is the reference SPL level [Pa] and 77.15 is the gain. How did you calculate the gain to be this specific value? Based on your algorithm and constants I see no reason why you shouldn’t be getting 100dB results. Please change your algorithm to make 2000 samples (instead of 50) and then post your Serial.print* output from when you are measuring a noisy place. The problem is solved. I changed the way to calculate the rms value. Thank for your articel, it helps. For gain, I measured the pot and other resistors, then I calculate by my self using formula gain for non-inverting amp. For samples, I did take 50, 500, and 1000 samples, and the results are still good. It can measure from 60-104 dB at particular places. And I use apps decibel 10th from IOS to compare the value. It has span 4-6 dB. But that’s ok, since I didnt use the real SPL meter. Glad to see you figured it out! Thanks for the interesting comments you provided. Based on the Adafruit schematic of the MAX4466 module I see that the gain is (22K+PotValue)/1K . For the benefit of the other readers, can you explain the change in the RMS calculation that you made? Was there a bug? For accurate calibration you will have to use a calibrated reference device. A calculation based on spec values will not be enough, because each parameter has some error tolerance. For example the sensitivity of the mic is +-2dB. With regards to the number of samples. If you only take 50 samples, you risk not capturing the entire wave length of lower frequencies. So at 50 samples and 40Khz sampling rate you might miss on frequencies below 800hz. Not sure if this is equally true for sounds of a single frequency as it is for natural sounds that are a mix of frequencies but still something to take in mind. For gain, yes I found on adafruit schematic too. For rms calculation, There was a bug. So I turned (long)sample1*sample1 into sq(sample1) to fix it. I guess you’re right about sampling. Thanks for your feedback. Thanks for the extremely useful guide! I’ve been running trough some problems trying to imitate your setup. When I try to calibrate my sensor using the code displayed at section “Analyzing analog input”, I get no difference in response whatsoever when I try to change the module gain. When connected to 3.3V in a quiet environment, the module outputs min and max close to 330, these values switch to min: 0 and max: 660 when I clap loudly. At 5V reference level, the min and max change to around 500~510. Is this normal behavior? BTW, I’m using a MAX4466 based module. Changing the gain will not affect the “base values” if there is no sound. For this module, the base is always module Vcc/2 . The values of 500~510 match Vcc/2 for Vcc=5V. Values of 330 match Vcc/3 for Vcc=5V which is 3.3V/2. I believe you are powering the module with 3.3V but using an 5V analog reference. Follow the article to switch to 3.3V analog reference and try again. Change gain while there is sound and see if your analog reading range changes in sync. Good luck. What pin do you use on Arduino for the mic and what pin on the HXJ-17 do you connect to Arduino for the analog data? Please include a clear photo of your setup. What values were you getting with analogRead before “free running” mode? the values i got from”analogRead” are between 0 and 1024, which i think is right. But know i doubt that there is something wrong about my setup, cuz i can’t understand some explanation you put.I’m working on them now. I’ve got all the data correctly.But I am wondering why the value i get from FreqOutData is up to 200, even in silence?Aren’t the spectrums supposed to be show nothing when it is silent? Have you managed to overcome the “free running” issue? For the benefit of the other readers, please let us know how to fix that. FreqOutData should not go that high for silence. See my “FHT in time” 3D graph above for an example. If it is going that high for you then you are not doing something right. Check your fht_input values to see if the issue is with FHT or earlier. Absolutely first class! Really enjoyed it, to the point where I am now waiting to get all the components to replicate your project. I have a question. If you wanted to measure that the “pitch” of the noise that you are monitoring has changed (it went from lower to higher frequencies), what modifications/additions to your code would you make? How do you define the “pitch of the noise”? Didn’t do something like this myself, but maybe other readers can contribute. Thanks for coming back so quickly. I used a very non-technical term. What I really meant is that the spectrum changes towards higher frequencies, possibly even into the ultrasonic range. If anyone has any ideas on how to measure this, I would welcome the thoughts. Thanks. Thanks for your helpful info really. i compile source file ( ArduinoSoundLevelMeter.ino in according your advise ( include mic gnd connect arduino uno gnd , arduino uno aref connect arduino uno 3.3v and mic vcc , mic ao connect arduino uno ao . Maybe it will be error value for us , if possible , please give me some advisement . Doesn’t sound like your values are bad. They could be correct. What kind of microphone module are you using? If you make louder sounds, does it go higher than -6? If you want to try another way of looking at it, try undefining FreqLog and watching the result values. Those won’t be in dB but in 8bit magnitude numbers. this is my sound sensor , maybe i will replace lm388 with MAX4466 later. I would not change AmpMax unless the max of your microphone behaves in a special way. If you want to add gain in software, use VolumeGainFactorBits. dB is a relative metric! It is common to define max volume as 0 and have the measurements as negative numbers relative to that. However, other reference points can be set. See a discussion above about calibrating the measurements to a standard reference of “20 micropascals”. Of course you can just add some constant value (for example 20) to your dB reading to make it “look” positive. I have not used it personally, but an LM388 should do the job just fine. thank you for Publishing your awesome Project. It is “1,000,000 L”, where L stands for the type “long”. Therefore, the value is 1M not 10M and 1. The factor 1M is for the number if ms in one second. A value of 10 for VolumeGainFactorBits means a gain of 2^10 . I have not tried with such a high gain. It is possible that for such a scaling the values overflow at some point. Hi, first of all congratulations for this excellent project. Im really looking forward finishing my noise meter, however im trying to get as much accuracy as possible. Have you tried using this module (https://www.amazon.com/gp/product/B00SOY52CU/ref=oh_aui_detailpage_o00_s00?ie=UTF8&psc=1) for getting a 16 bits signal? What you linked to is a DAC. I have not used it. It has no microphone so you will need to connect one properly. Another issue to mind is that it has a sample rate of 860 samples/second. This is relatively low for audio. You will only be able to identify frequencies of about 400hz and lower. Thank you so much for sharing such valuable experience. I really appreciate it and will all the success in your project. I found Grove – Loudness Sensor and I was wondering if you please tell me if what do you think about it in term of its capability of measuring noise level? Do you think it possible to use your code for this specific sensor? I have no experience with this module. It looks ok and will probably do fine for sound level measurement. As it does filtering and returns a positive envelop it will not work as a spectrum analyzer. Hi, thank you for your great work and nice theory explanation. It does not matter where arduino feeds. Electret mic (I have HXJ-17) or line level signal from speaker output. I need to display it. With 7 segment led display like in video, may be. Just follow the instructions in the article and show the result on a display instead of sending it via a serial connection. Hi, what if I want to use 5V module. is there any suitable coding? I’m use this module for my robot. I have problem with my 3.3 V input module. hence I need to use 5V. Not sure what you are asking. Which module are you talking about? thanks for your very useful article as a reference for my final assignment .. I have a project for my final project using analog sound sensor v2. sorry before .. i’m still very beginner for arduino.o programming i want to calculate the LEQ value of lunch (Ls), night LEQ (Lm) and LEQ daytime (Lsm) .. I am still confused by how to calculate the output value .. because I know that the output of the analog value of the sensor sound v2 is still worth the bit. is there any suggestion suggestion for me ?? so i can fix the error? o yah .. i will attach the program code .. I suggest you first implement the code in the article and see that you can calculate the dB value of the sound. From there adapt it to what you need to calculate (which I am not familiar with). Arik, thanks for your work on this. I’m currently working on a project that this will go a long way to taking the hard work out of but I’m having a bit of trouble and wondered if you could help!? Background is I have a race car where I need a sound activated exhaust valve (closing to reduce noise when it gets to a certain level) to stay within permitted decibel range. I have a motorcycle exhaust valve and actuator which is a motor with built in petentiometer. I’ve set it up so it initialises itself in void setup (sweeps back and fourth between fully open, closed and open again) then runs through your code for sound level monitoring to constantly adjust itself….the problem I have is I seem to be unable to use the analog read of the 5v petentiometer, I wondered if this was due to all the code you’ve implemented in your example settting use of 3.3v and voltage ARef etc. The pot on the motor is hooked up to 5v and the call seems to just halt the serial output debugging I’ve implemented? The final solution I intend on implementing is to use two mic’s to try and avoid environmental triggering of the exhaust valve due to other cars etc. But for now just being able to get the simplified version with one is my goal. If you have any other ideas I’m open to suggestions. I wouldn’t expect the code to halt in this situation. Hard to say why it happens without seeing the code. You are welcome to pastebin it if you like. You can pass 3.3V to your pot instead of 5V to make it more voltage-compatible with the rest of the system. However, higher voltage than reference should just give the max value, it shouldn’t crash the system/call. So I guess the issue is more complex. Perhaps something with where you are reading the pot. Try to disable some of the default modes (ADCReClock, ADCFlow, Use3.3) and see what happens. Thanks for the quick reply! I have numerous interesting projects on the go which is why I’m asking for help rather than battling my way through. I’m no C programmer so it may or may not be an obvious issue. There also might be a better way to implement the logic so feel free to suggest any changes. Ok, so at what point does it get stuck? What is printed on the serial up to that point? It completes lines 133 – 139 ourtputting your serial output lines and my RefDbValue (I put multiple calls in because I can only assume the mic input takes some time to initialise before valid values are generated). After that nothing, which I assume is halting on the void loop call to update the pot value line 149 as 150 isn’t printed. If I comment out 149, 150, 216, 218, 224, 226 then the motor spins in one direction until noise is made at which point it moves in the opposite direction…..this is the behaviour I want but ultimately with more control and position information from the pot to ensure it only either goes to fully opened or fully closed. To me it’s def the call to the analog pot pin 1 that seems to be the issue. Nothing jumps out to be as being wrong. I suggest you add more debug prints and do debugging in general to see what is going on. Perhaps you should sit with a more experienced programmer for this task. I managed to try your suggestion of disabling ADC, 3.3v and ADCreclock. Doing that means I’m able to call and retrieve the pot value and get the actuator working as required. Working through the different iterations disabling 3.3v and ADCFlow and having ADCReClock enabled is the only variation that works. Now I’ve got past that I can focus on the logic for efficient and effective sound suppression with the least performance degradation…..and also saving the reference dB value for power off / on use. Long way to go but at least I have the basics. Good to see that you managed. I guess something is incompatible between the regular analogRead and the special customizations above. Unfortunately I don’t have the time to look at that at the moment. Just disable anything that makes trouble and perhaps in the future I will release an updated version. I’m wish only to read the values of sound in dB. I’d amplified th microphone output by 100 before to enter in Arduino. I alsp use a sound level meter, placed near this microphone. The source of sound is a buzzer of about 3kHz. When I measure on the instrument from 50 to 90 dB, in the Arduino serial monitor I see from -8.6 to -8.3. Can you explain me where are my mistakes? Please post results of “MeasureAnalog” function. Once for no buzzer and once with buzzer. Also specify if you are using the 3.3V or 5V with the microphone and ADC. The measures are in order: MIN,MAX,AVG,SPAN. These values don’t look good. What is your hardware setup? What mic module? How is gain implemented? 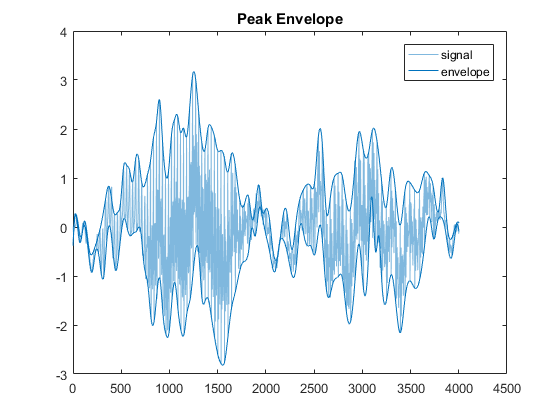 The article above assumes your circuit provides a signal that is biased at Varef/2 and that is Varef peak-to-peak. What you have is certainly different. Unfortunately, I am not familiar with the part you are using and can’t help you connect it. Not for the code in this article as-is, but you may be able to modify the code for your purpose. Your DC base is at 400/1024=~0.4Varef. You need to understand why that is like that or alter the code for your value. Your “span” is relatively small for such a loud sound. 178 peak-to-peak might suggest you need a bigger gain. You would be better with a span that is closer to 1024, to benefit from the full ADC range. If you post your mic circuit perhaps somebody will have additional suggestions. Please post results of “MeasureAnalog” function. Have you made any changes in code, components or schematic vs what is described in the article? i´m using a arduino nano with max 4466. Aref with 3.3v, anda the max4466 with 3.3v. the code is the same. These results look pretty random to me. As if no meaningful source is connected. What micro-controller do you have on your Nano? Post a clear schematic/photo of your circuit. Try to undefine ADCFlow and see if things change. Could you please send me your email, so I can send you my project and more details? i´m using arduino nano 328p, with a 12v power supply, an LM1117 to create a 3.3 bus for esp8266 and the mic max 4466.
output 3.3 of arduino connected directly to aref. I want to read the frequency with a MAX4466, to get the value and use it to move a motor. I try to use your MeasureFHT() program, but I don’t receive a usable value. Arik, thanks for your work on this. So far I could run your work (code) on a Arduino Uno R3 with a MAX4466. (With 3,3V) When I switched to the FHT and watched that with the Processing Tool I got results but also a lot of noise. Is that normal? I am working on a projekt where I try to identify different sounds of Akku driven powertools. My Aim is to run a process always when a spezial sound of powertool appears. The sezial sound I would try to indentify via FHT and spezial weights of Frequenzies. In general could this work? Regarding noise, you should expect some noise. Can’t say how much and not sure what “a lot of” is. In the end these parts are simple and are not for accurate measurements. Try to apply some averaging if you see that the readings jitter too much. Regarding your project, there is no yes or no answer. I feel this is achievable to some degree and detection certainty. Depends on your requirements and skills with signal processing / machine learning algorithms. I want to try that also.. The board is not the main issue. The library in the tutorial you linked to seems to measure only one frequency. This is different from a spectrum analyzer. It is up to you to determine if that is applicable to your problem. Is the FHT example code usable also with Arduino Leonardo. It compiled, but when I run it with FHT_128_channel_analyser, the graph has some values, but they are not changing at all. The code was written for the Uno/Nano and their ATmega328P micro-controller. You would need to port the code if you want to use it on a different board. Focus on the parts where there is work with registers: timers, stream reading from ADC, etc. thanks for your work on this. I’m trying to create a simple audio spectrum analyzer and I’m using LM386 for amplify the signal from the microphone. My goal is to calculate the THD (total harmonic distortion) but I need the RMS value of the harmonics according the equation 1. The element of the output array fht_log_out is uint8_t, but I need the RMS value. How can obtain these values ? Where am I doing wrong? Each FHT will give you one element per specific frequency. If you need a _mean_ value of a specific frequency you would need to run FHT a few times and do RMS on the various values you will receive for each frequency. RMS of just one value is the value itself and you can start with that for simplicity. I see. Well, unless you changed other parts of the code/circuit, 3.3V would be max ADC, so I assume max 8bit (255) would mean 3.3V. Try to feed the algorithm k=1024 instead of the value read from analogRead()/ADCH and see what would be the value of your first frequency bin. That should help you make a match between max voltage and max FHT bin value. Let us know the result in the comments. do you how I can write a code for an Arduino with light, I want the light start to go on when the mikrofon rekord some load sound. Thanks for this detailed post! I am using an Arduino Leonardo, and the MAX4466 with 3.3VRef. Doing a normal analogRead i get very nice sinwave graphed values centered at right above 500. But when i try using the ADCFlow with any routines in the loop i get 0’s with an occasional jump to 1 or 2…. Any suggestions on what i should try? See my reply to Avar above. The Leonardo has a different micro controller. You would need to port any uC specific code to the new platform to make it work. I am unable to reproduce. Have you made any changes to the code? If that is not what you have, try an updated library. Hello Arik Yavilevich, my name is Bill, congratulations for the work is helping many people. I am trying to reproduce this project for college, but it is not reproducing any value in the input A0 nor arduino serial print, I am using the LM393 sensor, which is sending signals in maximum amplification, but does not change anything in the lcd. do I have to change something in the code to work? I’m a newbie in the arduino study area. I’m from Argentina and I’m waiting for an answer. The LM393 is a comparator and might not work correctly for this purpose. Please include a diagram of your circuit and any changes you have made to the original course code. The code is the same as you offered on the site, without changes, even with the lm393 was to be variations on the port AO. but, the values ​​do not change. I want to measure the sound and then measure its waveforms. The module looks like a sound detection module. As described above in the article, such modules have a digital output (only HIGH/LOW) and not a waveform of the sound. Please post results of the “MeasureAnalog” function. It is a good way to see what data you are getting and to troubleshoot the situation. Hi Arik, thanks for your replying, finally i can run the code, thank you very much. Hi Arik. We are working on a project that needs to locate the direction of the sound source and we need to use FFT. Is it possible to have a real-time analysis of data using FFT? Yes. The project described in this article is doing real-time analysis of sound from a mic using FHT (FFT). No idea if this can help to locate the direction of the sound. Hi Arik.Thank you so much for this amazing piece of work and for your dedication to it.You’ve really simplified signal processing,analog and micro-controller electroncics and coding in one sweep for some of us. I have a question,is it possible to store the FHT output in the arduino like a template and use it for comparison with other FHT inputs?If so ,could you kindly share the code in arduino?Thank you in advance and looking forward to your feedback. What you have described should be possible, though you only mentioned it at a high level and you would need to decide how such comparison algorithm would work. There could be infinite ways to compare two FHT sequences. I have not dealt with this problem and don’t have relevant code to share. I would suggest to search for best practices of comparing FFT captures and locate an algorithm that will fit your case. Mind for memory requirements, as storing several FHT outputs might require more memory than basic Arduinos have. Thanks Arik for the feedback.I will research more.However i have come across the auto-correlation technique in most literature.I will delve into more research.Thanks once again. I am now considering using raspberry pi as u advised because of the more memory and processing capability.Any effective FHT or FFT libraries you could recommend that do an efficient job and require less computations? Unfortunately I can’t recommend anything for the pi, but I am sure there are plenty of options as well as processing power on that platform. Thanks Arik.Much appreciated.Could you recommend some of the ways one can compare two FFT outputs? Well first of all, thank you ! Your article is simply awsome and so well written, I understood a lot of things thanks to you. Really, this helped me so much. But I still have a few questions if you don’t mind. completely idle no matter what the sensor probes. Those are : “Time: 53 Amp: Max: 99% Avg: 99% RMS: 142% dB: -0.017”. All the pins are well connected and I even tried with several gain modes. So the AnalogRead is not returning anything, something ain’t right with the ADC I think. And I’m still searching where to change the ADC freq. divider mode, is it “ADCSRA = 0xe0+7;” ? And if changed, is there something else to change ? I have the Arduino UNO R3 and the AdafruitSensor w/ MAX4466 at the highest gain value (125%). If MeasureAnalog prints “Min: 1023” it means that your mic input always gives constant value=AnalogVRef. Something is not right and it is probably the circuit. You will not be able to get any meaningful values as long as this is the case. Try reducing the gain and double checking your circuit. If it doesn’t help post photo+schematic of your circuit as well as a pastebin of the code you are using. After checking with an ohmmeter, it was indeed a false contact with the AREF pin. I get some values now, but they don’t look like dB. (still negative, but changing). I tried to put a ref value and added a value in the formula to match with my sound meter (SPM01 TackLife) but the minimal dB (displayed 40dB by the soundmeter) is to high (57dB). If you have made a change to your circuit/ARef then you should start from basics again before going to dB calculations. By that I mean running “MeasureAnalog” and checking that you get expected min,max,avg values. If you intend to send code, please use https://pastebin.com/ instead of pasting it as text in the comment. (Time: 27 Min: 510 Max: 511 Avg: 510 Span: 1, 1, 0). Hi, these values are not that good. You are getting a flat signal. Your min and max are practically the same. Try to make some noise or increase the gain. Min and max should go farther apart and Span should increase. My mistake, it was with no ambient sound. Looks good then. dB is negative per how the reference point for dB is defined in this article. It is explained above. I lean very heavily upon others help but I do put in days and days of trial-and-error with my code and breadboards. Yet, after weeks of doing this, I am kind of stuck and after reading your blog, I am hoping that you have already figured this out. Here’s the question in a nutshell. I have my analog audio input on the Arduino pin A0, and, I did manage to implement code for FFT processing to drive an OLED in the frequency domain. However, I have yet to understand and figure out how to convert the output of this processing to a I2C data stream for controlling color based upon the frequency. This has been done by others and I see evidence of it on YouTube. However, getting any real insight and specifically help with coding is non-existent. If you have already thought this through and have helped others with it, please point me in that direction. I would not ask you to spend time on such a difficult topic for my own purposes but if other sections of your blog have covered this topic (I did a cursory search), I will study it and experiment with that new knowledge. Regardless, thank you once again for this blog. Not only is it chocked full of exceptional technical advice, it’s written eloquently. Live long and prosper. Do each part separately. Make sure you can do FFT and print the result to serial and separately light your Neopixels in any way you need them to be lit. Then decide how the FFT array will map to the colors. For example, if you have one RGB LED then you can divide the FFT array to 3 parts and the sum of each part (normalized) will set each of the 3 colors. Then where the FFT result is getting printed, write your mapping algorithm and send the values to part 2 of the code. You mention I2C but I am not sure in what context it is used. Naturally you should use relevant libraries for your project, such as Neopixel or I2C libraries, and not spend time on implementing the driving logic yourself. Thank you very much for the speedy reply. I apologize for not having been more clear. Still, I think that with your explanation to study over, I would just have one follow-up question please. To clarify, disregard the I2C reference. I should have known that by using a DATA_PIN and the FastLED or AdaFruit Neopixel library, any data streams to control the addressable LED strip is taken care of. Sorry about that bit of confusion. I am sure that rigorous studying of your blog would lead to a better understanding as well. Just to wrap up my ramblings, here’s the YouTube video example showing the affect I seek. Thanks in advance and thank you for allowing me to presume upon your good graces. Believe me, it’s more appreciated than you could know. Best. I read back through your articles on this subject and, combined with your last reply, found exactly what was needed. So, thank you very much for your time and expertise. I continue to learn from your blog and it’s a tremendous resource in so many ways. Happy to hear that. You are welcome to post a link here to your end result if you are going to make it public. Thank you Arik. If I am successful, I would be happy to post it. The public is ALWAYS welcomed to anything they find useful. Keep up your very fine and inspirational work. Boa noite, antes tentei fazer o projeto com o lm393, mas como voce tinha falado ele não é amplificado, comprei um MAX4466, mas estou tendo dificuldades para calibrar, eu tenho que inserir algum valor no programa? Me ajude, estou precisando finalizar esse projeto, mas não sou muito bom com arduino. muito obrigado pelo grande trabalho. Good night, before I tried to do the project with the lm393, but as you said it is not amplified, I bought a MAX4466, but I’m having difficulty calibrating, do I have to insert some value in the program? Help me, I need to finalize this project, but I’m not very good with Arduino. Thank you so much for the great work. To perform calibration you first need to have working dB values which are relative to mic max. Does that work for you? Those are negative dB values. Then measure the sound level with another calibrated device and add any difference between the measurements to your value to make both reading the same. Hello, thank you very much for responding, on my lcd this with 0% and – 49 dB, I applied a frequency of 920Hz, through a mobile application 5cm away it varied to 6%, – 25dB, how to calibrate and change the values ​​for a value close? First, having the dBs increase when making a sound is a good sign. When you are asking how to calibrate it you have to decide what to calibrate it with. I assume you want to calibrate it with a typical sound meter which is relative to the standard agreed sound pressure baseline value of 20 micropascals. Take a standard sound meter and your Arduino sound meter. Measure some sound in similar conditions. If your meter measures the sound as -25dB and the standard one as 50dB then you need to add 75dB to your sound meter readings to make them reference the same baseline point. Not sure what you are asking. Trying to guess that you might want to also “play” with your gain setting. If your min is 0% at the arduino device then you might want to increase the gain to have a value greater than 0%. Then re-calibrate. Can you be more specific to what module you are using and how it is connected to the Uno? The code in the article is specific to the MAX4466 and similar modules. What you probably have is a sound detection module and not a module that provides a sound waveform. See module comparison section in the article above. Specifically, based on your “low noise” “analog measure” printout, you can see that avg reading is 31 and not 512(=Vcc/2) as desired. Thanks for this very thorough article. I am currently a high school senior doing a project that requires recognizing the frequency of sound and based on the frequencies to control a mini robotic car. But I ran into some problems running the MeasureFHT() method. I am using an Arduino UNO and a MAX9814 microphone for sound input. Since I am not familiar with the “#” notation, I kind of ignored the error “warning: extra tokens at end of #ifndef directive” And I commented out the Serial.write() so I don’t get binary results. However, I got the same results, ranging about 20 to 80 and sometimes a huge number pops out regardless to the input. I suspected that the input was not even considered because when I disconnected the microphone it still gives the same results. It would be great if you can help me sort out this problem. 1) Do note that the MAX9814 is an automatic gain module. So had to predict how it will behave for this purpose. Your values will be “normalized” but a value of X at one point might stand for a completely different sound volume at another point. This is because the module adjusts the gain constantly. 2) At what point did you get the “warning: extra tokens at end of #ifndef directive” error? Is this with the original code? What line is the error on? 3) If you commented out serial.write, how did you arrange for the output to be printed? Perhaps post your current code on pastebin and link here. 4) Did you do MeasureAnalog and MeasureVolume and found the results correct and as expected? If unsure, post those outputs too, for both quiet and sound cases. 2) the error points to the line #define use 3.3 and #ifndef Use 3.3, so I commented out the #define use 3.3 then both analog and volume seem to start working. 4) MeasureAnalog and MeasureVolume both seem working. I can see that your MAX9814 module is “DC based” at 1.25V . You can see that in the Avg value of the MeasureAnalog function. For comparison, the MAX4466 (for which this code is written) is biased at Vcc/2 which will show 512 at the Avg value of MeasureAnalog when all is proper. The can be an issue for the current MeasureVolume implementation but shouldn’t be an issue for frequency analysis. If general sound level measurement is important to you then you will need to make modifications to the code to make it process your 1.25V biased signal correctly. Other than that I see nothing wrong. I see you made changes to the serial printing code and I am not sure about your motivation for those changes. The reason why you sometimes get a large value is because you are printing both FHT bin values and the sample rate to the serial channel mixed together. Originally, the bins or each FHT invocation are printed in a single line followed by “dt” and the sample rate. You modified it to print each bin on a new line so it might look like a mess but in reality it is probably accurate. I suggest you revert to the original code and then debug it by using a sound generator. Figure out how different sounds show up in the bin values of the FHT. Good luck. I tried again with the original code except I still had to comment out the #define use 3.3. I wonder what should the output be, should it be about the same as the frequency the sound it takes in or something else represents that particular frequency. The default in the code is binary output. This allows you to integrate out of the box with processing visualization (as described above). The proper way to switch to textual output is to comment out “#define FreqSerialBinary” on line 29. The original code doesn’t put a new line between numbers of the same run. See lines 227, 288. So the output is not like you listed. The output is one line per run. Each line contains FHT_N/2 bin values followed by dt and sample_rate values. To understand how the bins work, read the FHT part in the article. It is all explained there. Similar to Elton’s case, I had to comment out the #define Use3.3 to get the spectrum working. I would like to know whether it’s possible to get the exact frequency of sound played in serial monitor as TEXT. If so, then I was hoping you could point me in the right direction. It should be possible but you will need to implement it. After each FHT, go over the bins and see which one has the highest value. Convert the index of the max bin to a frequency range based on the explanation above. Print the center of the range and there you go. Thanks very much for your blog.. it is very useful.. I have done every step that you explain.. I have to adapted the code. Could you check my first values? Amp Max:102.53 AVG:29.91 RMS:284.57 DB:-8.19 /// HERE one CLAP !!!! The time is approximately 20 millisecond for 2048 samples. i’m using CJMCU-622 module (do you know it? ), do you think it will help to get spectrum of the sound? for me, it is very strange how the FHT works to divide the adc information in the spectrum zones.. I am not familiar with the CJMCU-622. Looks strange to me that “talking person” values are lower than “no sound” values. Can you adopt MeasureAnalog function to your platform and post the results for both sound level cases? You can see that the 0 offset for your mic/amp is at 416 ADC reading. This article and the accompanying code defaults to 512 (Vcc/2), so it wouldn’t work well in your case without modifications. Otherwise looks valid. What does 416 ADC mean in terms of voltage? What should be the baseline of your mic/amp? Your sampling rate of 100K samples per second should work well for sound processing. thanks for your comment about the mid value, the Vref isn’t correct.. now I have correct the reference. What does 416 ADC mean in terms of voltage? when I connected the adc to Vdd, the value was 817..
What should be the baseline of your mic/amp? I guess now should be ok.. I think the function wont work, the library has a lot link to other arduino libraries. do you know another library in C code to easy implement? thanks for all your advice..
Good results. Your “Avg” and “Span” values now mean perfect sense. With regards to ARDUINOFHT, it is made for simple AVRs and might not work on a Cortex M4. The ARM is surely more powerful than the AVR so if anything, it should be easier to do FHT there. As always, if you find a library or code that works for you, please share here. Good luck. I used the same library but it is included in the SDK 15 of the nrf52840. I had to solve some problems..
1.- Config the FFT function, and understand how to use it. //here calc the magnitude, the function arm_cmplx_mag_q15 or other doesnt work for me, I use the following FOR cycle. 2.- Problem… I checked the data, using tones from youtube (5000 hz sound tones) for example. or a scale tones from 0 hz to 20 khz.. To check the result.. Finally I have the synchronize the matrix with the frequency. The speed of calc of the cortex M4 64Mhz is the following.. If you have a buffer of 2048 measures.. you can get 6 curve per second (12700/2048 = 6) each curved of 1024 point. If you have a buffer of 256 measures.. You can get 64 curve per second, each curves of 128 point. Thanks for all your advices.. I dont know where is problem? I think there will always be an error in your results; from the beginning, for the formula “RMS” you consider that an acoustic wave is similar to a sinusoidal wave. However, it is not the case. The ideal would be to use a true root mean square formula on several samples and in this way obtain a result with an fixed integration time as in real sound level meter. Yes, RMS is an estimate. A lot of components in this build are not accurate. I consider a sound level meter on an ATmega328P to be in the “I can’t believe this even works” category rather than “this is a replacement for a real dedicated measurement tool/device” category. You are welcome to improve the implementation though. Hi Arik, how i do this project without LCD? ?can i use serial monitor in Rduino IDE? Just don’t connect an LCD and remove any LCD lines in the code. The LCD doesn’t have any part in processing the sound it is just so the end device can be stand alone. I believe there are already serial prints for all the interesting bits, but of course you can add more if you want. wow thank for your fast respond arik…may i ask again brother?? so, what i have to do for the project is to upload your program to my arduino board right? ?using one of microphone module….is that right arik? ?or is the something else that i have to do ?? is your source code that you share in this blog ready for compile to arduino board arik??. If you don’t have any Arduino experience you should take some time first and do a few basic projects first. Hi Zaki, FHT is the library that you need to do frequency analysis. If you don’t need that you can remove that part of the project. is that a normal value arik? ?and why i get minus dB value arik, and can i change it to positive value? What dB value did you expect? The code calculates dB value relative to dB=0 for max sound that your device can capture. You can move the values to a positive range simply be adding some numeric value to the result. For example, add 50dB and you will have positive values. Read more about calibration in the comments and article above. halo arik…thanks for answering all my question arik…arik, how if i expect the sensor value between 0dB-80dB arik?and can i get an average of dB value? for example arik, i want average of dB value for every 30 seconds? ?should i calculate it manual arik? ((t1+t2…+t30)/30)) or are there an easier method arik?? Hi, a regular average seems simple enough. what coding we use to get an average of sensor value every 30seconds arik? ?is there any reference arik?? If you search “Arduino average” you will find a lot of examples. halo again arik…arik, which coding line i have to change if i want to get positive value form sensor value arik? (i get sensor value between-2dB-(-36dB)..
how if i want to get a sensor value in range 20dB-70dB arik?? It will not be possible to reach a dB range of 50dB with a 10bit ADC used in this setup. A range of ~35dB is what you can expect to get. thanks arik…if it is not possible for me to get that range, is it possible to callibrate sensorvalue with desibell meter that i used in my smartphone arik? yes, this is explained in the comments above. i already tried to get average of sensor value for 30 seconds arik, but it did not work,,can you help me arik?? Hello Arik, congratulations for the project. I’m new so I do not have much experience. I would like to obtain only the value of decibels to later establish a certain value and be able to reproduce an alarm by voice through a speaker when that value has been exceeded. For now what I need to know is the measurement of the decibels. I am at the initial phase of using your code. No changes to the code. // what do we want to do? But the function MeasureFHT(); does not work – the serial monitor show something like when the baud rate is wrong. By default `FreqSerialBinary` is set and the code is meant to be used with a processing visualizer. Read the section about the “FHT 128 channel analyser” above. If you want a textual serial output, undefine `FreqSerialBinary`. Thank you very much for the fast reply. I understand. I will continue and I am looking forward to set up the complete application. This project “sounds” interesting (sorry had to do it). I have been playing with Arduino for a couple of years now and also have been wanting to do sound analyzing on my bee hives just for personal research/playing around. I am curious in learning if I can detect when there is an intruder in the hive by the elevation of the hive sound along with other unknown findings with sound (like death of the queen, poor health/good health, hive temp = vibration from wings heating or cooling the hive, etc). I already own two of the microphone devices that you spoke of, HXJ-17 / Keyes module and Sound detection module. Would either one be better for my project (I’m thinking HXJ-17)? Do you have any suggestions or tips that you could give? As mentioned it he article, the two devices that you have lack an analog output and/or an amplifier. So they would not be useful what you are trying to do. You would be better with a device like Max 4466 or something more advanced. Yes, I misunderstood that part about the analog output, makes sense! Thank you. What a wonderful article !! loved reading it. I am a beginner to sound related project, but I need to work on a project, where I need to detect abnormal noise on a running machine. Based on the complexity of sound wave & pressure theory, please suggest if using max 4466 with arduino is capable for the job or not. In normal operation the machine would generate a sound level of 100 dB, while when the abnormality is there, the sound level goes as high as 115 db. Can you please help with the sketch which specifically works for this dB range accurately using max 4466. Yes, should work. You would have to test and experiment with different settings. The sketch is already published in the article and it is not specific to one dB range. Happy to hear that. Have fun with the costume! Hai again Arik…thank you for alway answers my questions arik…this is really helpful for my project arik…i found something new in this project arik…when i uploaded my program, i got a range value between 20dB and 50dB(highest)…but when i used a long jumper in my circuit, i got a range value between 9dB and 50dB(highest)…the long jumper in my circuit extend my range value! !…i dont know why,,,do you know something about this arik?? This is interesting. I assume that when you mean “long jumper” you refer to a longer wire between components? Which components are farther apart now? The lower limit is determined by how quiet the input is. That could be because the microphone is now farther from a sound source but it can also be electrical. The system has electrical interference and that adds some randomness to the signal. When this “noise” is strong the wave is farther from 0 signal and the dB is higher. Perhaps you changed something and that decreased the amount of electrical noise in your system. please help me arik…thank you..
i dont know why this happening arik..
My guess is that the relay adds noise and influences the microphone. Try to put them far from each other. You might want to talk to an electrical engineer about this issue. thank for your answer arik…. but is this okay arik??? if you change 20 to another number then the result is no longer dB.